Extra Care Information for the Venus Fly Trap Fans! Everything you ever wanted to know about how to raise a Venus Fly Trap. Venus Flytraps love outdoor sunshine and air movement, mineral-free water and growing medium, and watering to keep the growing medium hydrated but not swampy and constantly sitting in water. Venus Flytraps love outdoors sunshine, and need 4 hours minimum during the growing season (March-Sept) if at all possible. It is possible for them to get too much heat, but it’s rare, just when the heat goes above 95F or so with full sunshine. In this case you will want to temporarily move your Venus Flytrap to dappled light, or shade if necessary, until the temperature lessens. If you have your Venus Flytrap in a larger pot with lots of growing medium, they’ll likely never overheat regardless of temperature because they are well-insulated. But otherwise, they can reach a point where their rhizome and/or roots become too hot, and in this case they should be given a break from the heat. Another option in very hot conditions is to allow your Venus Flytraps to get sunshine outside from sunrise to 11 a.m. or so, and then remove them from the intense heat if it is above 95F. The foliage of Venus Flytraps can handle the heat as long as it has been naturally acclimated, adjusting to increasing temperatures as the season changes. It is the roots and rhizome that can get overcooked. However, the foliage can get sunburned and scorched if it is introduced to direct sunshine from other conditions such as being indoors, coming from a significantly different latitude, or being placed outside after being in a greenhouse. In terms of water, you can give your Venus Flytraps either Distilled Water, reverse osmosis water, or clean and fresh rain water. A lot of people ask if they can use well water or river or creek water and unfortunately that answer is no, because these sources do contain minerals that are harmful to Venus Flytraps. You might possibly be able to use your tap water, if the mineral ppm (parts per million) is 40 or less. You can check this by purchasing a TDS meter (Total Dissolved Solids), they’re only about $10, and testing your tap water. But most tap water is high in minerals and not acceptable. To water your Venus Flytrap, you wan to bottom water or “tray” water, which means to place the Flytrap in water so that it draws up the water from the bottom of the pot. Top watering is discouraged, because it can result in crown rot. To water your Flytrap, just place it in the water you have poured in a tray or sauce or similar container, and let it sit there for 30 minutes to an hour or so to draw up the water from the drainage hole at the bottom of the pot. Once that time period is over, remove the pot from the water. You don’t want to leave your Venus Flytrap sitting around in water for more than 1-2 days, because it can easily lead to rot. However, if you live in conditions that are very hot and dry, you might be safe leaving your Venus Flytrap in water all day, as the growing medium will dry out enough to not waterlog the plant. In such extreme conditions, it might even be necessary to leave the plant in water all day, otherwise it will dry out. It helps in such extreme conditions where drying out is a threat, to pot your Venus Flytrap so that in the bottom third of the pot you have really packed in the growing medium tightly. This method will help the growing medium retain water for longer. Be sure to keep the growing medium around the plant itself just moderately bouncy and not packed in tight, or else your Venus Flytrap will not be able to grow effectively and will suffer or possibly perish. You want to pot with brownie density on the bottom, and pound or angel food cake density on the top. This keep the growing medium more likely to be moist on the bottom and with enough openness to grow on the top. For growing medium, you have 2 choices really. You can do a peat moss growing medium, or a long-fibered sphagnum moss growing medium. Each has its pros and cons. Peat moss can be obtained at almost any home improvement or Grange type of store. You can combine the peat moss with Perlite, which helps keep the soil from being too tight and waterlogged. You can also add silica sand, if you have access to it, but silica sand is very hard to find and should be the ONLY type of sand you use. Any other type of sand like beach sand and play sand and landscaping sand, have many minerals that will harm you Venus Flytraps. Peat moss can be combined with Perlite at a ratio of about 1 part Perlite to 5 parts peat moss. If you are using silica sand, the best formula we can recommend is to use a 5:3:2 ratio of peat moss:perlite:slica sand. Plain peat moss works just fine, but a bit of other material breaking it up is optimal. Optimally, you’ll want to “rinse” your peat moss or peat moss mixture. You can do this either before or after potting your Venus Flytraps in it. If you have a container with drainage holes, you can place the peat moss in it and then pour mineral-free water over it and let it move through the peat moss and out the drainage holes at the bottom of the pot. You’ll want to do this 3-4 times. This “rinses” the peat moss/mixture of minerals. You can test after your procedure, by marinating some of your rinsed growing medium in mineral-free water and then testing that water with a TDS meter, to make sure it’s 40 ppm or below. You can also do this rinsing procedure as just a normal process of watering, which is much easier, but takes longer to remove the minerals. In this case, you hydrate your peat-based growing medium first, hydrate it and mix it, and then pot up your Venus Flytrap. Then, for the first 3-4 waterings you’ll water from the top, and let the water drain out and away from the plant (not in a tray). Normally, top watering is not recommended, but just for this process, it’s OK.
A peat moss mixture has the benefit of being more insulating from heat and cold than long-fibered sphagnum moss. It is also less costly and easier to find locally. However, premium long-fibered sphagnum moss has its own benefits. Long-fibered sphagnum moss is a luxury growing medium for Venus Flytraps. Interestingly, it has a higher ppm as measured by a TDS meter, but the minerals it does have are not harmful to Venus Flytraps, unless they accumulate over 6 months or more of time, which is when any Venus Flytrap needs to be optimally re-potted, with 9 months to a year being the far end of that recommendation. It must be stressed that PREMIUM long-fibered sphagnum moss is good for Venus Flytraps. Much of what is available at home improvement or gardening stores is unfortunately very sub-par long-fibered moss, and will degrade into mush very quickly, which is not good at all for your Venus Flytraps. What you want for your Venus Flytraps is “Premium” long-fibered sphagnum moss, which is mostly offered from New Zealand, sometimes from other sources like China. You can find this moss online at a few sources, but be sure to check around for pricing, because it can vary a lot depending on the provider. Premium long-fibered sphagnum moss helps your Venus Flytraps grow quite a bit faster, and recover from transplanting and repotting much faster. It is incredible, actually. It does not in fact have the extent of the insulating power of peat moss, but is’ not terribly far behind, maybe 2/3. Long-fibered sphagnum moss also needs to be refreshed or re-potted every 6 months or so, whereas peat moss and peat moss mixtures can go longer, 9 months to a year or so. So, there are benefits and costs for each, but both are good options as long as you ensure you are potting your Venus Flytraps in a quality and clean home! Finally, the issue of Flytrap feeding. Shocking news headline, you do NOT need to feed your Venus Flytrap. They, like other plant organisms, are magicians in terms of manufacturing food from….sunshine! They get enough food from photosynthesis. This is not to discount their incredible and unique ability to catch frigging bugs wow, but truth be told you don’t NEED to feed them. However, Venus Flytraps do grow faster and larger if you feed them responsibly. By “responsibly”, that means not feeding them hamburger meat or Seymour’s blood. Just bugs, really, worms, etc. If it fits in the trap you’re probably good. Hard-shelled bugs do tend to eat their way through the traps, but the plant still gets the nutrients. 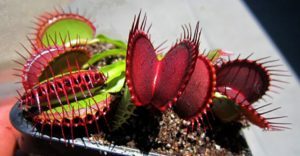 There are a many dangerous myths and misconceptions out there about Venus Flytraps, most based around this idea of Venus Flytraps being “swamp” plants. The reality is, they’re not swamp plants, and that type of condition could easily kill a Venus Flytrap. Which brings us to the topic of terrariums, known to pristine Venus Flytrap growers as actual death-traps for Venus Flytraps. If you’ve read any part of this article, you’ll see why terrariums are bad news for Venus Flytraps. In a terrarium, you’ve got no outdoors UV rays from sunlight, no air movement, over-watering, over-humidity – it is a recipe for death and rot. Some people can grow their Venus Flytraps under artificial lighting, but it is rare that a grower can keep their Venus Flytraps healthy while under lights for any long period of time. There just isn’t enough UV light in artificial lighting, as compared to the sunshine. Also, there isn’t any air movement inside, to blow away mold, fungus, etc. If you’re interested on perspectives on indoor lighting, you can check out FlytrapCare.com forums to see what growers who use artificial light are doing in this arena. People who use indoor lighting to grow their Venus Flytraps typically recommend using lighting that is in the blue wavelength, 6500K or so, and placing the lights about 6 inches above the Venus Flytraps plants. Artificial lighting optimally requires a timer, too, so you can match the on/off light cycle to what’s happening outdoors. We do not recommend outdoor lighting, but if it’s what you feel you need to do or is your only option, then at least do it as well as possible, with timers, air movement, and lots of observation. Finally, there is the topic of seasonal needs for Venus Flytraps. There are 3 main growth periods for Venus Flytraps during the year. These are Dormancy, Growing Season, and Breaking Dormancy. Dormancy typically occurs during around October to March, in the Northern Hemisphere. Dormancy is basically hibernation for Venus Flytraps. As the tree leaves die away for the season, so do Venus Flytrap traps. Venus Flytraps also lose many of their traps during this time, Dormancy, but not all. They lose mostly their outer traps and their taller traps. Venus Flytraps hunker down into a rosette, and rest for the winter. Red Venus Flytrap cultivars, such as Purple Haze for example, lose even more traps than green Venus Flytrap cultivars, so much so that you can barely find a trap at all and they appear to have died. Many people actually think their Venus Flytrap is dying, when it is really just going Dormant. If you are caring appropriately for your Venus Flytrap and it is Dormancy-time then your Venus Flytrap is almost certainly simply going Dormant when it appears to be ill, so not to worry. An ill Venus Flytrap will also lose and blacken traps, but it will not be mostly the outer traps only, and new growth will come out black or mutated. A Dormant Venus Flytrap will just have the blackening outer traps, and will show healthy new growth with no mutations or blackness. Though they do lose many of their traps and appear to be much smaller than they are during the Active Growing Season, they do have a beautiful development, which is an intensification of any color tendencies they might have. An FTS Maroon Monster, for example, can become almost black in appearance. Venus Flytraps grown in different climate zones go into Dormancy along a spectrum of intensity. Venus Flytraps in areas that have shorter daylight hours will go more Dormant than those grown in areas nearer the equator that have less seasonal variation and longer days, for example, Montana v. Florida. Venus Flytraps that go more intensely dormant lose more traps and appear much smaller than in the Active Growing Season. Venus Flytraps grown in Florida, for example, will go dormant because daily light cycles will shorten but not as much, so the plants lose many fewer traps. They will lose taller traps and grow low, but often they will still look as though they are actively growing in the regular growing season. Venus Flytraps go Dormant in order to protect their foliage from freezing, to preventively keep all of their traps from freezing off. In less cold temperatures, there is no need to sacrifice as many traps. This might lead you to ask, well then why do they need a Dormancy at all in warmer temperatures? The answer to this is that Dormancy has evolved in the Venus Flytrap species such that it is evolutionarily viewed by the plant as a requirement for health overall as a species, even if it’s not technically needed in warmer climates. Even though Venus Flytraps are taking a necessary rest, they are still growing at a rhizome level and also still putting out new growth and little baby traps, just much more slowly than during the active growing season. The blackened traps that are sacrificed during Dormancy are fine to just leave on your Venus Flytrap plant and they won’t harm the plant, but if they start obscuring UV light from reaching your Venus Flytrap, they should be removed. Dormancy is triggered in the Venus Flytrap plant mostly by outdoor shortening light cycles as the season changes and the daylight hours shorten. Lowering temperatures also contribute to your Venus Flytrap figuring out that it’s time to go Dormant. Optimally, a Dormant Venus Flytrap will have exposure to outdoors ight cycles and lowering temperatures. A greenhouse would enable both of these to occur safely, especially with a space heater that is set to turn on if temperatures go below freezing. However, a greenhouse (and a reverse osmosis system) are costly and space-consuming, so there are other options that are less optimal but will work for your Venus Flytraps during Dormancy. The first option is a windowsill that gets the most light possible. Your Venus Flytrap will get that critical exposure to natural ight cycles. By virtue of being near a window, your Venus Flytrap will also get cooler temperatures, albeit not in the optimal range of 45-55F. A second option is a garage window with great lighting. This is probably an even better option than a home window, as temperatures are likely to be cooler in a garage but not reach freezing. A third option, which is somewhat risky, is the “fridge” option, where you place your Venus Flytraps in a sealed container, with moisture available, in your refrigerator. Venus Flytraps do go into an interesting static state when placed in cold temperatures, and while they do degrade some, they can remain intact for quite a while if temperatures are very cool (but not freezing). However, this is a somewhat dangerous method because the plant could die in this state, especially if it is a smaller Venus Flytrap with a smaller rhizome. Dormancy is required for the long-term health of your Venus Flytraps, and should not be skipped. A minimum of 6 weeks Dormancy will get your Flytrap the rest it needs to grow during the active growing season. If you do skip a Dormancy, your Flytrap will probably be OK for one skip, but it’s not recommended to skip Dormancy at all. The Breaking Dormancy period is a period of what appears to be very fast new growth, but is actually the Venus Flytrap releasing energy from its Dormant rhizome and funneling it into re-growing the traps it sacrificed for Dormancy. The rhizome does still grow and mature during Dormancy, just more slowly than usual. So, some of the foliage you see during Breaking Dormancy is actually growth due to new rhizome growth, but most is just traps growing again. The manner in which the traps and leaves (“stems”) grow during Breaking Dormancy is kind of hilarious. They grow straight up, like periscopes coming up from under the sea to take a look around. Or like meerkats! After a few weeks, they’ll loosen into their typical growing style, but that first Breaking Dormancy growth is a sight to see! Breaking Dormancy is super fun, because it’s incredible to see how large the traps are that arise from the Dormant rhizome, in comparison to the little baby traps that the plant has retained during Dormancy. Like a phoenix rising from the ashes, a Breaking Dormancy Venus Flytrap is an unexpected delight. Just like Dormancy surprises Venus Flytrap growers every time with the shocking loss of traps, Breaking Dormancy is shocking every time, every year, even if you’ve experienced it for years with your Venus Flytraps. Unlike Dormancy, though, it’s a true delight, to see all of these excited traps popping up to see what the season has to offer. The other delight of the Breaking Dormancy period is that often this is when the largest traps of the Active Growing Season are sent up, so you see some very impressive larger traps. A very important event that also occurs during Breaking Dormancy is that a flower stalk will develop on Venus Flytrap plants that have a large enough rhizome, usually those around 1-2 years old. It is very important that these flower stalks are clipped off at their base when you see them. If you let them develop they can easily kill your Venus Flytrap, and at a minimum a flower stalk will very seriously deter the growth of your Venus Flytrap. The flower stalk requires a tremendous amount of energy, and will take that from your Venus Flytrap plant, debilitating and sometimes killing the entire plant. The cute little white flower that emerges is entirely not worth letting it grow and steal energy from your previous Venus Flytrap plant. Snip that sucker off. Seriously. If you want to try to collect seed, then research it well and approach it with one of your least favorite Venus Flytraps, because letting a Venus Flytrap flower is almost always so not worth it. The Breaking Dormancy period is brief, a month or so. The Venus Flytrap plants then transition into the Active Growing period or season. During the Active Growing Season your Venus Flytraps will eventually drop their periscope traps to their normal growth pattern, and maintain their appearance, and grow in size, though you likely won’t notice much because Venus Flytraps typically grow quite slowly. The Active Growing Season is approximately between April and August, and nearing September you’ll see your Venus Flytraps dropping out of the Active Growing Season and starting to transition into Dormancy. With lots of direct sunshine, your Venus Flytraps will also show some coloration changes, mostly on the trap interiors, sometimes being so extreme as to bleed through as lines on the outside of the trap. This happens more with certain cultivars, such as for example FTS Flaming Lips. Most cultivars will develop some pink to red coloration on their trap interiors, with the exception of the all-green cultivars such as Grun and Justina Davis. You won’t see the very deep coloration you see during Dormancy, but in most cases you’ll see some nice color develop on the new traps’ interiors. Interestingly, when Venus Flytraps get a great deal of sunshine and heat, such as in New Mexico or Arizona, they tend to not develop color, and even colorful cultivars appear all-green. Another side-effect of very hot climates is that the foliage tends to curl over some, in an apparent attempt to hunch over to avoid the extreme heat. Venus Flytraps that have been in these conditions are still healthy, but boy are they hard to repot! It’s quite difficult to get underneath those curled over leaves and traps in order to get growing medium around the rhizome. See our other articles for detailed information about potting, growing containers, and even growing from seed, if you want to get down into the details even more. Happy flytrapping!